Buderim artist Olga Garner-Morris is a national treasure. Olga Garner-Morris remembers the day Ronald Reagan eclipsed her like it happened yesterday. It was June 7, 1982 and the free-spirited artist was standing on the stairs of Buckingham Palace. She had arrived moments earlier in an old Australian ute owned by her third husband, Derek – yes, third, there have been four in total. “I’m impatient,” Olga laughs when queried about her love life. “I’m not prepared to put up with anything,” she adds, her tone firm and confident. And help her Derek did. As a “mad royalist” and antique dealer, the Englishman had introduced her to a new possibility – to gift Queen Elizabeth with a painting. “He wrote to Buckingham Palace and said ‘this is my wife, this is what she does. She’s going back to Australia and as a matter of appreciation she’d like to give one of her paintings to the Queen to say thank you’,” Olga says. On this momentous occasion, the couple – the quirky artist and the traditional Brit – drove through the palace gates, flashing their official invitation to the guards. The vehicle came to a grumbling stop and the pair’s wide eyes took in the red carpet stretched before them. The crowd of people gathered outside the gates cheered with gusto. “My husband started waving back to everybody. These huge doors opened up and in we went. There was my little Australian painting, up against these huge walls that were built in the 15th century. “William Heseltine [the Queen’s private secretary at the time] came to meet us and said, ‘I’m afraid the Queen cannot personally see you today as the President of the United States Ronald Reagan is flying in’. “I was only upstaged by the US president. That’s why all the crowds were there,” Olga says with a hearty laugh. Olga has had plenty of brushes with fame during her artistic career (she also gifted Prince Charles and Princess Diana a painting for their engagement), but has no interest in retelling these stories. “I could name drop all over the place, but it would bore me to tears,” she laughs joyously. Olga’s artistic journey began as a curious four-year-old who made the mistake of scribbling in her mother’s precious encyclopaedias. Unsurprisingly, she was punished, but this incident also unleashed something in Olga – a creativity that she harnessed into a successful career. “I used to win prizes in competitions and win money and that related to me as a very young person that there was a possibility of making a living to support my mother who was a widow. Right through school it was always art, art, art. I went through every form they could teach me. “People say ‘oh gee, you’re clever’. No, I’m not, I’m talented, there’s a difference. I utilised my talent that I’ve been gifted. It wasn’t just a dream, it was single-mindedness. As an artist one is very selfish. It’s a drive and you can’t help yourself. You need to paint. It’s like being an addict. From her first job in her home town of Wollongong dressing windows at a local store, and through the twists and turns that eventually led her to the Sunshine Coast, Olga has carefully mastered her art. One of the most influential lessons came early. In 1969 she took leave from her job, bid her two young children goodbye and jetted off on her first overseas trip. In six weeks she took in Greece, Rome and London, immersing herself in art galleries and exhibitions. She had an epiphany. Her first ‘big break’ came eight years later when she staged her first major exhibition in the Wollongong town hall. Each night, after putting her children to bed, Olga would escape to the garage to create and paint. The finished product was a body of 100 works. From here she put herself through the National Art School in New South Wales. She was a single mum, working, raising two kids and studying. It took sheer determination. Life has been an adventure-fuelled journey for Olga – she and her children spent two years living on a 65-foot yacht sailing through the Mediterranean, she has exhibited everywhere from Malta to the United Kingdom and has had more than 30 solo exhibitions. Even as recently as this year, she had a lovely email from the curator of the Broadway Gallery in New York inviting her to stage an exhibition. And although she passed the opportunity up – citing old age as the reason – Olga has no plans to put her paintbrush down just yet. 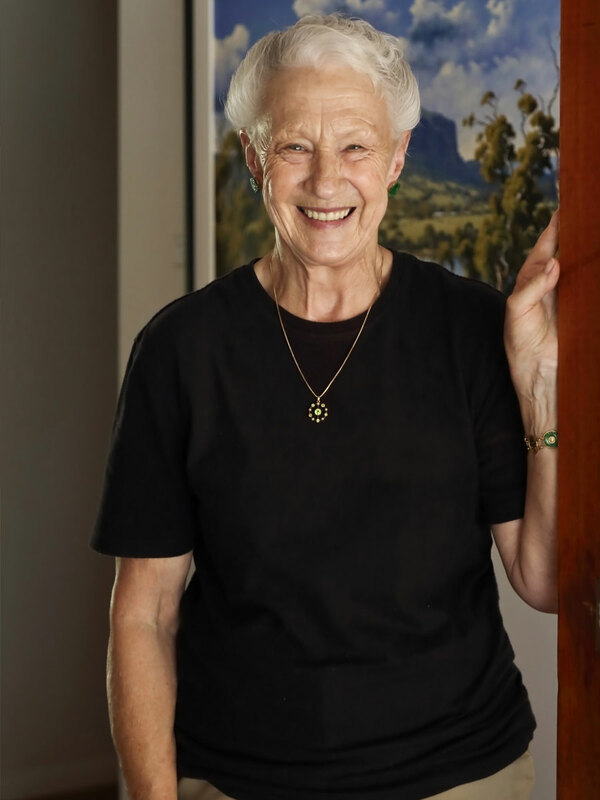 Her magnificent works are on display in her exquisite Buderim home, which is now open to the public. “My husband has been under palliative care for some years and my daughter lost her husband some years ago. We bought this house and brought it back to its original condition. It has beautiful, huge walls and we paint so decided to open a gallery. There is no escaping the beauty of the home, or the works. Guests are invited to wander from room to room taking in the art. The work is varying – from landscapes to abstract – and stunning. “I’ve broadened my horizons into abstract,” Olga says. “I paint commercially and sometimes because it’s beautiful, I love it and I know someone will buy it. These days you are up against some of the best photographers you can come across. Therefore I also paint for the mood of what the art world is moving towards. I take on fashion design, markets. I notice these things. I notice what’s happening around me. The Garner-Morris Gallery is at 201 Ballinger Road, Buderim.